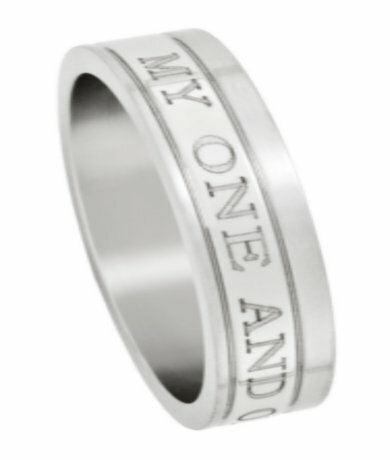 Mens stainless steel love and sweetheart ring for the "one and only"
Lasered into this 316L Stainless Steel ring is the inscription "My One and Only". At 6mm wide, the ring feaatures a high polish finish with a band effect around the ring and a flat profile. I purchased this ring as a birthday gift for my husband and he loved it. Will recommend this place to my friends and family. 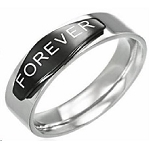 Wedding ring is exactly as shown. My partner and I both really like them. Well worth the money, very good deal. Shipping was really quick. I would definitely do business with Just Men's Rings again! 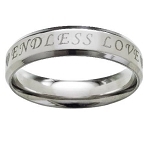 This ring is perfect!!!! My husband loved it, as today was our wedding day. It went wonderfully with everything else!! !